Public Works Department Minister Gulab Singh Thakur said that State Government is providing top priority for the construction and maintenance of roads in the State and the restoration work of the damaged roads was being done on priority. He said that Public Works Department had achieved the target of metalling, tarring and periodic renewal of 2378 km roads during the year 2010-11. The Department has identified the roads in the State to be taken up for restoration and maintenance on priority including Parwanoo-Wangtoo National Highway. Thakur was presiding over a meeting of senior officers of the Public Works Department to review the work of metalling, tarring of roads damaged after unprecedented rains during last season. 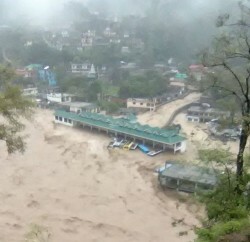 He said that roads were badly damaged in the State due to heavy rains and snow in the winter causing loss of around Rs. 54.80 Crore. 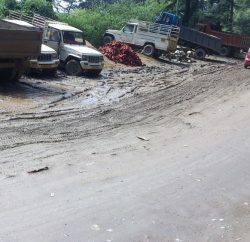 The department is doing its best to restore the damaged roads by undertaking tarring and patch work on a large scale and to accomplish this task at the earliest 48,000 bitumen drums had been provided to all circles and added that more bitumen would be made available as per the requirement. He directed the officers to complete the tarring and patchwork before the ensuing rainy season and said that the patchwork would be completed by the end of this month besides completion of more than 60 percent tarring work. Public Work Minister said that tarring on 246 km roads and periodical renewal of 659 km roads had been done since September, 2010, whereas new tarring on 683 km and periodical renewal of 1695 km road length was done during last financial year. He said that tarring on 29 km road length and periodical renewal of 137 km roads was completed in the month of April, 2011. Minister said that the State Government is ensuring the best use of waste plastic in construction of roads for which every circle had been provided shredder machines. During 2010-2011, the plastic waste was used in periodical renewal of 42 km road length, whereas this year, so far 19 km roads had been constructed with the plastic waste. As on now, plastic waste had been used in construction of 61 km long roads in Shimla, Kangra, Hamirpur and Mandi zones of the State. 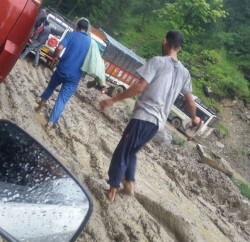 Gulab Singh Thakur said that State Government is repairing roads in Shimla District on priority bases. NH-22 from Parwanoo to Wangtoo in Kinnaur District is on top priority. The authorities have been directed to speed up the work on Theog-Rohru road so that smooth flow of traffic could be ensured on this important road. Besides, tarring and 15 km long Parwanoo-Jabli Path 14 Km long Solan and 11 km long Barog byepass, 15 km long Shimla-Delhi byepass, 18 km long Theog-Naini Dhank patch, 5 km Naini Dhank-Kandyali patch and 16 Km long Kingal-Bairakhad road patch will complete this year. 21 km long patch of Rampur and Wangtoo will repaire and maintained during this period. Principal Secretary, PWD Dr. P.C Kapoor informed that tarring and mettaling work of National Highways has been speeded up in the State and the department is targeting finish it in this financial year.